My nose is a tad blocked this evening so I thought I would clear my palate and nose with a huge hop bomb. This is the perfect beer for the job, it's a 100 IBU, whole hop cone imperial IPA! I've had it once before and I hope it's as good as I remember. In terms of appearance this is quite dark as IPA's go, with a two finger creamy head resting atop the liquid. The beer itself is a deep copper colour with little to no carbonation obviously apparent. However the head has excellent retention and when it finally does subside it still rings the glass and also leaves seemy decent lacing. Once this beer warms up you are hit with a full afront of citrus and pine elements on the nose. There is quite a lot of bitterness present from the hops, as well as some very sweet smelling grapefruit. I can also smell a fair amount of bready malts for an imperial IPA, which seems odd for a beer with 100 IBU but what can you do. There also appears to be a fair amount of alcohol on the nose. Hopefully this one tastes as good as the last one I had, as I don't remember the nose being quite like this. Flavour-wise the Hoptimum is brilliant! The beer is nice and bitter as is full of hops. The predominant flavours are of pine and grapefruit, as with almost all Californian IPA's. The only slight downside for me is quite a strong alcohol flavour, which particularly as the beer warms up has quite an effect on the flavour. Other than that though, it's a lovely imperial IPA. 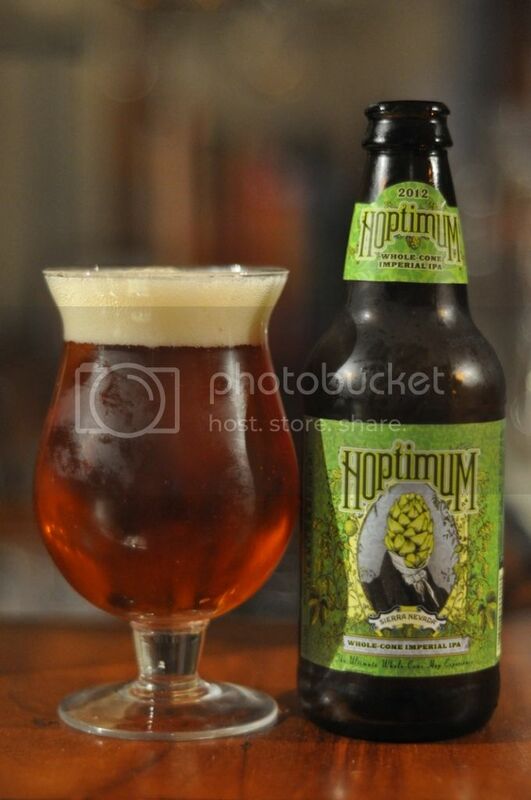 I think I hinted to it earlier without explicitly saying it, but Hoptimum is a Sierra Nevada beer. And this lives up to the quality of their other beers, it's spectacular! It's quite malty for an Imperial IPA but the huge amount of hopping comes through strongly, so don't despair hop-heads! Hoptimum is a really nice Imperial IPA but one that certainly won't appeal to people new to the style. I find it delicious though.